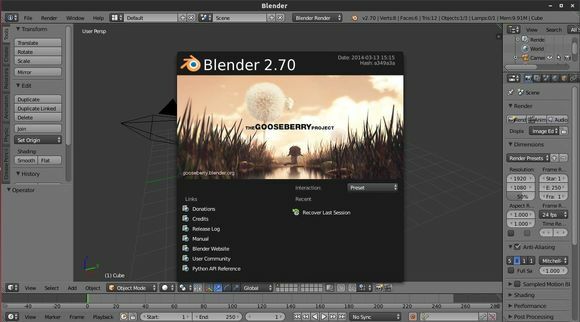 This simple tutorial is going to show you how to install the Blender 2.70 in Ubuntu 14.04, Ubuntu 13.10, Ubuntu 12.04 and Ubuntu 12.10 via PPA repository. 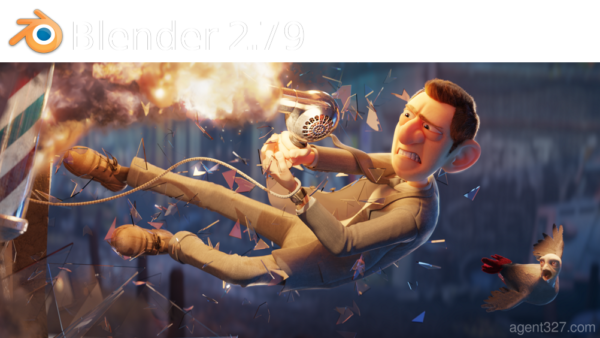 At the moment, Blender 2.70 is at its second release candidate. 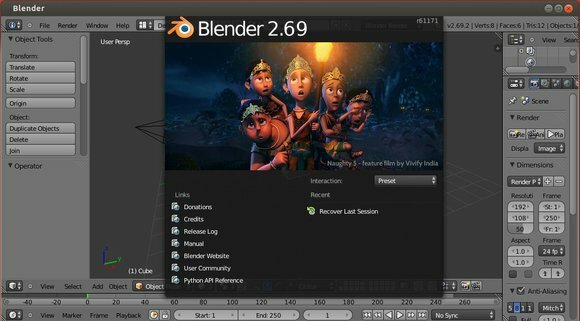 New features include initial support for volumetrics in Cycles, and faster rendering of hair and textures. The motion tracker now supports weighted tracks and has improved planar tracking. For mesh modeling there are new Laplacian deform and wireframe modifiers, along with more control in the bevel tool. The game engine now supports object levels of detail. The first results from the new user interface project are also in this release, with dozens of changes to make the interface more consistent and powerful. This is also the first release of the multithreaded dependency graph, which makes modifier and constraint evaluation faster in scenes with multiple objects. See the release note. The IRIE Shinsuke’s PPA contains the 2.70 RC builds for all current support Ubuntu releases. You’ll be able to upgrade to the Blender 2.70 stable version via this PPA when it’s released. To do so, press Ctrl+Alt+T on keyboard to open the terminal. 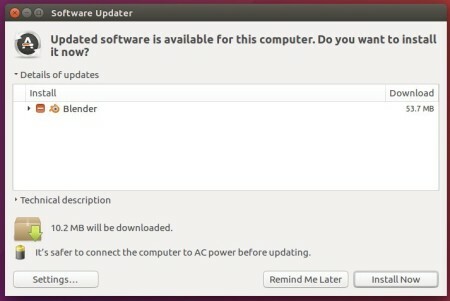 When it opens, run the commands below one by one to add the PPA, update system and install or upgrade the software. 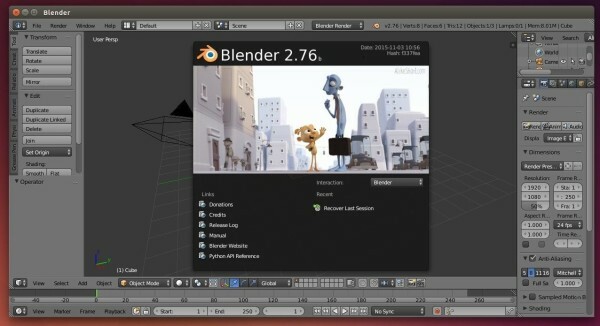 Blender 2.69, the latest stable release of the popular 3D creation software finally is available for Ubuntu & Linux Mint via PPA one week after Blender 2.69 was official announced. A new hidden wire display option was added to help with retopology. Mesh Bisect is a new tool to cut meshes in half. The Bridge, Edgenet fill, Grid fill and Symmetrize tools were improved. New curve and lattice editing tools were added too. Hair rendering was improved with a new Hair shader and reorganized settings. Subsurface scattering uses a new sampling algorithm and now supports bump mapping and texture blurring. Sky rendering now uses a more accurate sky model. New blackbody, vector transform and HSV nodes were added. The non-progressive integrator was renamed to Branched Path Integrator, and is now available for GPU rendering. The Motion tracker now supports plane tracking, which can be used to replace billboards, screens and other flat things in footage. Lists in the user interface can now be resized, sorted and filtered. Further there are small improvements for vertex parenting, empty objects, the shrinkwrap modifier, mask editing, armatures, f-curves and drivers. FBX Import support has been added and FBX/OBJ can now export split normals (without the need for the edge split modifier). In addition to the new features, over 270 bugs that existed in previous releases have been fixed. 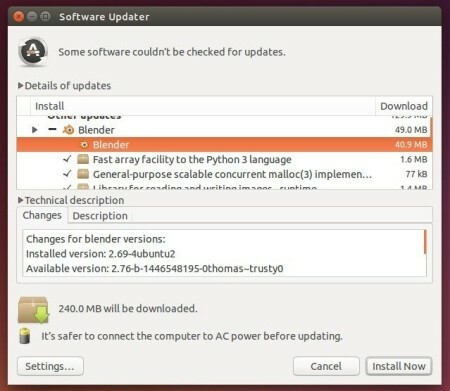 The PPA has updated for Ubuntu 13.10 Saucy, Ubuntu 13.04 Raring, Ubuntu 12.10 Quantal, Ubuntu 12.04 Precise, Linux Mint 13/14/15/16. PPA now works for Ubuntu 14.04 LTS, Ubuntu 14.10 and Linux Mint 17 / 17.1.